There are plenty of reasons for playing slot games. You may be a fan of a certain film or television programme and can’t wait to play a slot based on that show, for example Fremantle Media’s ‘Take Me Out.’ But at the end of the day most of us, if not all of us, want to play a game in order to win lots of cash. That’s where multiplier symbols can really help you. When you play a slot game each winning combination has a value attached to it. You may win five times your bet if three matching symbols come along at the end of a spin. However, with a multiplier attached that win can become much larger, and take home 10 times, or even 20 times your win. Of course they’re not the easiest to get but when they do turn up you’re really going to be delighted. They can double or triple your winnings which is good news but in some cases the multiplier can increase your winnings by a much larger amount even as much as 100x. Multiplier symbols can often appear in 3 reel and 5 reel games. They sometimes only appear on some not all of the reels and on the whole are the wild symbol in the game. It’s often the case that the multiplier symbol in the slot game is the wild symbol. This substitutes for other symbols in the game and therefore help create winning combinations that wouldn’t normally have happened. For example, there are two Ace symbols next to each other on the reel and that won’t give you a winning combination in most games. However if the wild ends up next to them this substitutes for an ace and bingo you’ve got a winning combination. Now you might be asking what’s a wild got to do with a multiplier? Well, when the wild gets you a winning combination that’s not the end of the good news. That’s because in most games it doubles that winning combination, i.e. a 2x multiplier. It makes sense for the wild to be the multiplier symbol as its main function is to create winning combinations that boost your account balance. The multiplier is simply the icing on the cake. For example in the NextGen slot ‘Cherry Blossoms’, the wild symbol is the Geisha Girl and when that symbol creates a winning combination, you get a 2x multiplier. Scatter symbols can also behave in this fashion but of course their leading role is to help get you into bonus games which leads us neatly into the next section. 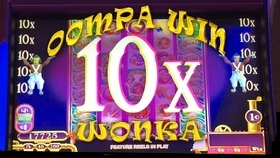 A multiplier also plays an important part in a bonus game. It’s common for wins in a bonus round, particularly one that has free spins involved, will all be multiplied. Here there isn’t a specific symbol that causes it, simply part of the rules of the game so check the paytable to see if there’s one in the game you’re playing. That’s definitely the case when you play a game that has a bonus round where you can actually choose the multiplier in the bonus game. Some games have a pick ’em style game that sees you choosing certain symbols and behind them are different levels of multipliers that are then applied to the upcoming bonus round. For example in the ‘Cashanova’ slot game from Microgaming there’s a Free Range Bonus round. Before it starts you have to choose from a row of fried eggs (it’s a chicken themed game) and this helps determine the multiplier for the round. You’re always going to be happy to see a multiplier symbol or feature. It’s increasing the size of your win so why would you be anything but delighted. It’s a key factor in getting you really big wins especially in bonus rounds. We just don’t seem to appreciate or get excited by them as much as we should because there are so commonplace. We’d certainly miss the multiplier if it didn’t exist.